Massage is an excellent way to enhance the mind-body connection and promote whole-body healing. Regular massage can alleviate chronic pain, improve energy levels, and bring a sense of balance to your life. Massage is especially beneficial for clients who experience back pain, headaches, high stress, or anxiety. Our talented, highly trained massage therapists are adept at providing soothing massages to loosen tight muscles, reduce stress, and enhance your general well-being. Each massage is customized to the client’s needs and preferences. And we offer massages in many different time increments, so you can choose if you want to indulge in a little pampering—or a lot. Our certified Massage Therapist have special training in prenatal massage. Regular massage during pregnancy can reduce stress, improve circulation, and alleviate sciatic nerve pain, a common complaint during pregnancy. Massage also allows expectant mothers to relax and spend time in a soothing, calming environment. We feature a special massage table for prenatal massage, which provides a safe massage position and extra comfort for moms-to-be. This table has custom cutouts for the chest and belly and gives pregnant clients the option of lying on their side. Our new Hot Stone Massage is designed for deep relaxation. Our massage therapists place warm salt stones on different accupressure points on your body, using direct heat from the stones to relax your muscles. We use a variety of strokes to massage kinks in your muscles, leaving you blissed out in a state of PURE relaxation. Hot Stone Massage can help boost circulation, release stored tension and recharge energy levels. It’s a great treat for people who experience muscular pain, stress, or depression. Add a little romance to your life and book a side-by-side massage or facial in our intimate couples spa room. It’s the perfect way to take time out from your hectic life and reconnect with each other. After our luxuriously pampering treatments, you and your honey will be fully relaxed. We’ll set the mood for romance—what you do next is up to you! 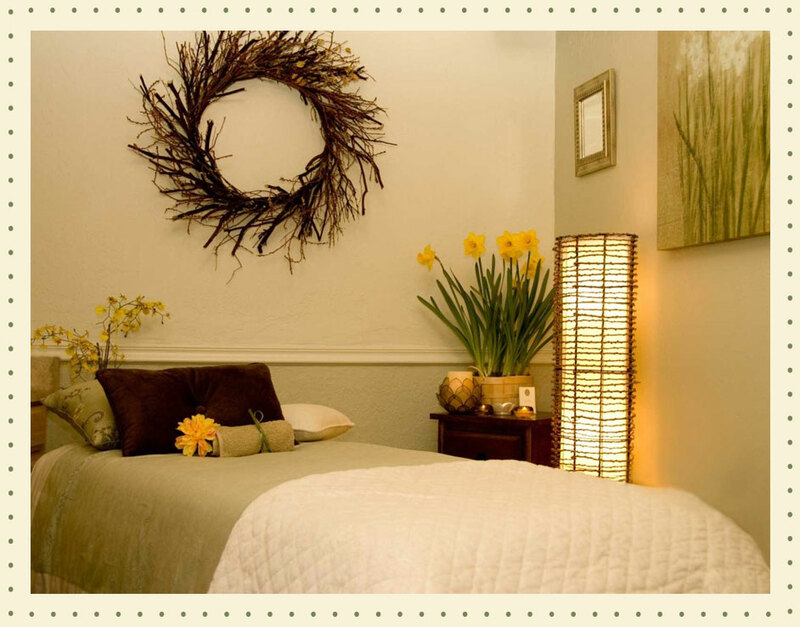 The couples spa room can also be booked for spa parties or for mother-daughter pampering at no additional charge. Reflexology can be added to your massage or booked as a stand-alone treatment. or 35 minutes for $45. Massage therapists may incorporate the following styles. When making an appointment, please specify which style you prefer so that we may match you with the appropriate therapist. Long, flowing strokes, firm kneading, and light tapping characterize the Swedish massage. Swedish massage is one of the most popular massage styles and is ideal for stress reduction and relaxation. Deep tissue massage is an excellent choice for clients who struggle with chronic pain or muscle tightness. The massage therapist focuses extra attention on tight, knotted muscles and uses strong pressure to alleviate pain. This healing massage style helps release tight, contracted muscles and improves circulation. It can reduce chronic pain and muscle soreness. In myofascial release, the massage therapist may use his or her knuckles, elbows, or forearms to work on the fascia, the soft tissue that supports and protects the underlying muscle. A sports massage can help athletes improve flexibility and achieve peak performance. It can also help reduce the risk of injury. Or, if an injury has already occurred, sports massage can be beneficial in promoting rapid healing. Energy work is ideal for stress-related conditions and promotes deep comfort and relaxation. By placing the hands in specific areas, the massage therapist eases tension, pain, and stress. During reflexology, the massage therapist stimulates certain points on the feet and hands that correspond to other parts of the body. This type of massage is ideal for those who are on their feet all day or suffer from foot problems like plantar fasciitis. Reflexology helps promote whole-body health.